A cycling club that has grown rapidly from a few friends enjoying a weekly ride to an 80-strong group has unveiled its new kit for members. 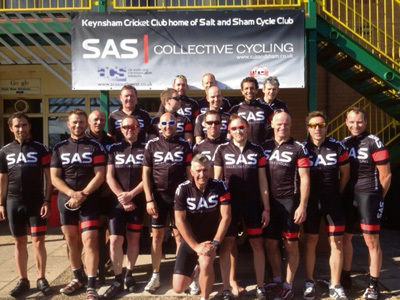 Riders from the Salt and Sham Cycle Club, which takes its name from Saltford and Keynsham, will now be instantly recognisable on the roads with their new black and red kit, emblazoned with “SAS Collective Cycling”. The group, which is made up of all abilities, meets on Saturday mornings at Ashton Way car park for a 40km lap of Chew Valley Lake, ending at Keynsham Cricket Club for bacon rolls and refreshments. The group’s website is now live, so visit www.saltandsham.co.uk for more information.